You are here: Home » MEDIA » Books » Zombie Apocalypse: Endgame by Stephen Jones (book review). 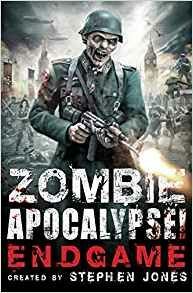 Zombie Apocalypse: Endgame by Stephen Jones (book review). ‘Zombie Apocalypse! Endgame’ is the final volume in a trilogy of ‘mosaic’ novels put together by acclaimed horror editor Stephen Jones between 2010 and 2014, using contributions from some of the genre’s best-known names including Ramsey Campbell, Lisa Morton, Peter Crowther, Jo Fletcher and Michael Marshall Smith, along with other writers not normally associated with horror such as British SF heavyweight Stephen Baxter, who is a major contributor to this book. I’ve previously reviewed for SFCrowsnest the first volume, ‘Zombie Apocalypse!’, along with two single-author follow-up novels, ‘Horror Hospital’ and ‘Washington Deceased’, and enjoyed them all. Will this one follow that trend? In the first volume, ‘Zombie Apocalypse!’, we were eye-witnesses to the outbreak of the living dead, as excavations in Lewisham upset a mass grave that had lain undisturbed since the Bubonic Plague hit London in 1665. This unearths hundreds of bodies and thousands of small red fleas. The latter somehow reanimate the former and, within weeks, London has been transformed into a war zone, as human survivors try to evade the shambling undead. In book two, ‘Horror Hospital’, humanity starts to fight back against the encroaching undead horde and, for a while, things look to be on the up. That is, until it becomes clear that not all zombies are created equal. Some of them seem to be more intelligent than the others, which makes them a lot harder to kill. Still, how intelligent can a zombie really be? ‘Zombie Apocalypse! Endgame’ tells of the emergence from the chaos of a group of highly intelligent and organised zombies who appear set on taking over the entire world. At their head is the 19th century architect and black magician Thomas Moreby. He designed the church in South East London whose crypt formed ground zero for the zombie outbreak in book one. He now has his sights set on the White House, from where he intends to refashion the entire world in his own, undead image. Unsurprisingly, that’s not a good sign for what’s left of humanity. Can they do anything to stop him? As before, the novel tells this story through a varied series of texts. They include, for example, an article from a horror fanzine, extracts from survivors’ diaries, letters, emails, blog posts, song lyrics and so on. These provide an enormous variety of colour and perspective on what’s happening, which build up into a coherent whole rather like a pointillist painting. As with the previous books, the main advantage of this approach is that it provides a very immediate reading experience, bringing you close to the action for multiple characters, rather like flicking between news channels to see many different eye-witness reports from the same war zone. However, the mosaic approach is also this book’s biggest weakness. At times, it’s easy to lose sight of the wood for the trees, as some of the entries don’t drive the overall story forwards clearly enough. There are also lots of interesting back references to characters and plot points from the previous two novels. However, the mosaic nature of the storytelling can make it a challenge to remember the previous pieces being referred to and therefore to put the new material into context. At times, I found this a little confusing. ‘Zombie Apocalypse! Endgame’ brings the strengths of the ‘mosaic’ novel format to this fascinating departure from the usual story of mindless zombies destroying civilisation. Instead, we see intelligent zombies putting into effect a centuries-old plan to take over the world, whilst a dwindling band of human survivors try to fight back against the seemingly inevitable. Stephen Jones should be applauded for creating a distinct zombie mythos and for persuading so many top-drawer authors to share their talents in the production of these books. ‘Endgame’ provides an exciting conclusion to the original trilogy and is well worth seeking out. After you’ve read all three doorstop-sized novels, you should be as ready for the end of the world as you’ll ever be. Zombie Apocalypse! by Stephen Jones (book review). « Crimson Peak: limited edition (2015) (Blu-ray film review).